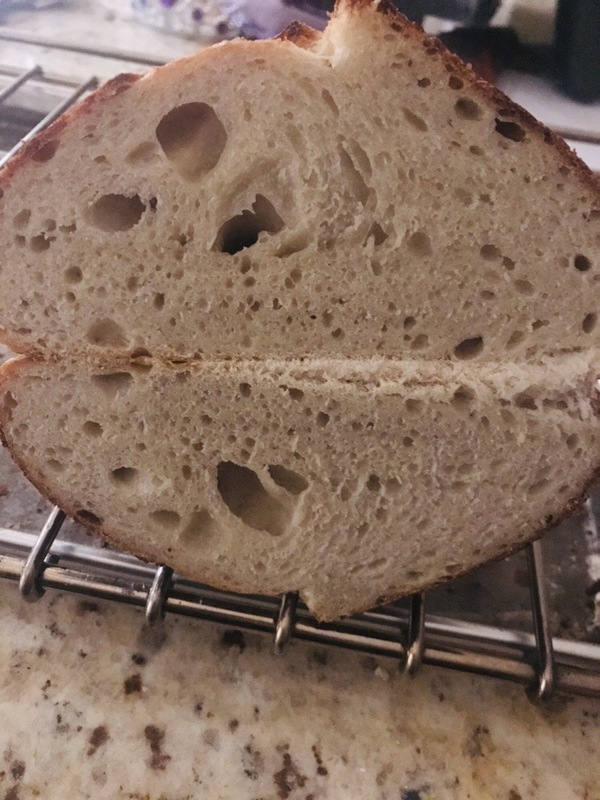 I wanted to post and have everyone give their opinions on my loaf. It is a 100% BF loaf. Starter fed 8pm night before. Mixed starter, flour, water and salt. Autolysed room temp (72ish) for 1:30. Coil folds every 45 mins for 3xs bulk fermented for 6 hours shaped and proofed in banneton for 2:30. Pre heat oven with convention heat to 500. Have a pot with stone and cover. Also, preheated. Placed loaf covered with some ice and cooked for 20 mins on convection heat @500 removed lid and lowered temp to 450 for another 20 mins. Your thoughts and advice are welcomed. Thank you! Certainly not 190 g water? Then it's an excellent result considering that you have 57.5% hydration loaf. Made with KABF. During the winter. Yes I realized after that I miss calculated the hydration. It’s never winter where I’m at south Florida haha. But thank you. for 57% hydration, that's brilliant. How on earth did you manage coil folds on such a stiff dough? Thank you Carole. I cool folded every hour for 4 hours maybe that’s why the dough had a chance to become somewhat slack. I’m making another tonight let’s see how it comes out. I just feel my starter is not as active as it needs to be.